All events, which are free and open to the public, are April 11-12 in Atwood Memorial Center. Parking is $1.50 an hour in the 4th Avenue Parking Ramp. Panel: "Priorities for Funding Immigrant Focused Projects in Minnesota." Kathy Langer: Catholic Campaign for Human Development Fund. Keynote Lecture: "What If We Looked at Immigrants Differently?" Speaker: Bruce Corrie, professor of economics, Concordia University. 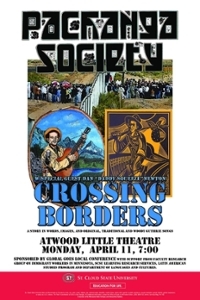 Musical Concert: "Crossing Borders: Cruzando Fronteras: A Musical story About Immigration Told in Words, Music and Images." Band: Stearns County Pachanga Society with guest accordionist Dan "Daddy Squeeze" Newton. 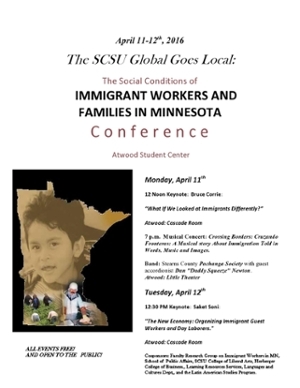 Panel: "Issues of Social Practice and Policy in Minnesotan Immigrant Communities." Panelists: Students from Stephen Philion’s SOC 460 Social Practice and Policy class. Ahmed Ali, lead staff organizer, Greater Minnesota Worker Center. Keynote Lecture: "The New Economy: Organizing Immigrant Guest Workers and Day Laborers." Speaker: Saket Soni, Executive Director, National Guestworker Alliance. Panel: "We are Minnesota: Recent Immigrant Oral History Project." Panel Organizer: Consoler Teboh: Professor, SW 618 Advanced Generalist Practice with Refugees and Immigrants Seminar. 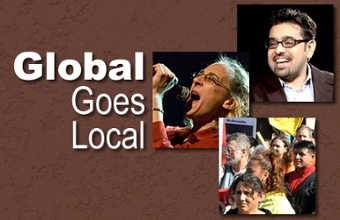 Global Goes Local is organized by the Faculty Research Group on Immigrant Workers in Minnesota, which is funded by the School of Public Affairs and the College of Liberal Arts. The Bruce Corrie lecture is co-sponsored by the Office of the Dean of the Herberger School of Business. Pachanga Society’s performance is sponsored by Learning Resources Services, Latin American Studies Program and the Department of Languages and Cultures.